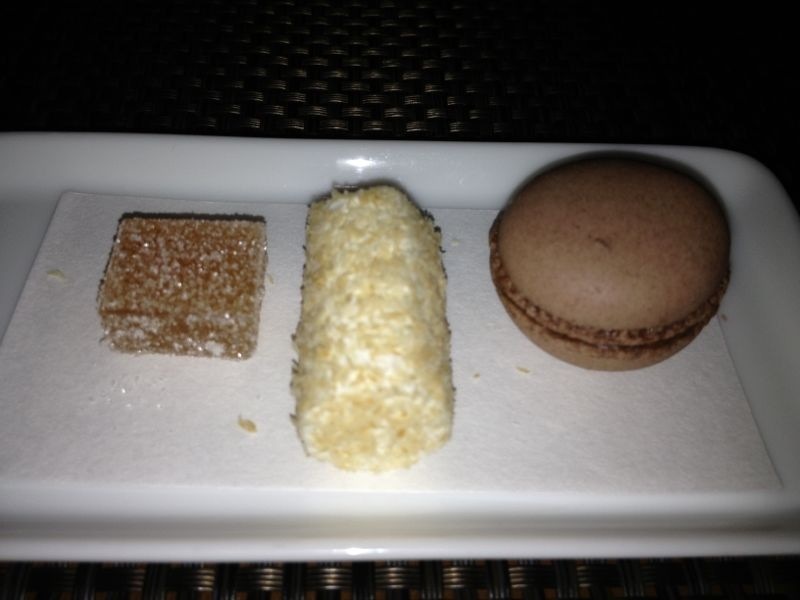 CUT by Wolfgang Puck: Expensive but well worth it. Steak. The Final Frontier. Wait, that’s not right. Well you know what, for today it is! There are a few things we really miss living in Singapore. One of course is a good steak. I am talking about the juicy, medium-rare, bone-in, grade-A, cooked in 10 pounds of butter, filet from Mastro’s that I so miss. The second is good Mexican food. I am not going to spend any time on the latter here. It is an ongoing quest and we are coming close. 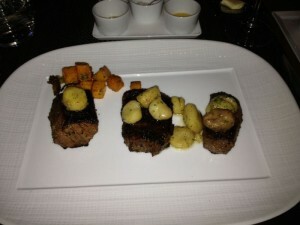 But Steak I have found and the restaurant is Wolfgang Puck’s CUT here in the Shoppes at Marina Bay Sands. Located inside the busy (and way too expensive) mall, this restaurant is the classical dark wood interior you would expect from a good steak house. CUT is the 3rd steakhouse for Chef Puck, the first being in Beverly Hills, CA of course. As you walk in, there is the obligatory bar and a few tables. This is especially handy if your first time to CUT you do not know shorts are not allowed in the dining room! Fine, I’ll eat at the bar. We did, but this is our 2nd visit. On this 2nd visit, we spent a few minutes at the bar but then, being appropriately attired for an evening out with the wife, we proceeded to the dining room. 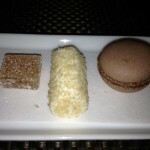 By the way, it was Saturday night because when I called on Wed. for Fri reservations, they were booked. Call early in the week! Continuing, the mix of patrons is young and old, some local many tourists, and the atmosphere is relatively quiet. The wait staff is hyper-attentive and is on-hand immediately should you need anything. When they ask you about bread, get the pretzel rolls! They are the best! For this dinner, YAW had the filet (always a good choice) and I had the steak sampler. Yes, you read that right. It is actually called the “Tasting of New York Sirloin”. The tasting includes one USDA PRIME Illinois Corn Fed (120g), one American “Kobe Style” from Snake River Farms (Idaho, US. 120g) and a final piece of Japanese Wagyu from the Shiga Prefecture (Honsu, Japan. 60g). The cuts are served left to right in the order I listed (see photo too) with a sauce to match each style. Sauce?! This is steak! No, I did not use the sauce although I did sample the flavors. All 3 cuts of meat were fantastic and cooked perfectly. Of course the Wagyu was amazing and very tender. It was hard to save that for last or at least a majority of it. In the picture, you can see the cuts and the side of bone marrow. That stuff is so rich it is like melted butter (good to try once but likely not again). 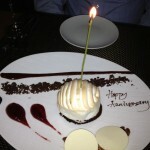 To top this off, we had one order of the Baked Alaska desert. Yes, I asked them if they would light it on fire at my table. No, they did not. I think the wait staff thought I was crazy when I asked. Is that only on cruises? It was really good and I look forward to trying it again, even with no fire. 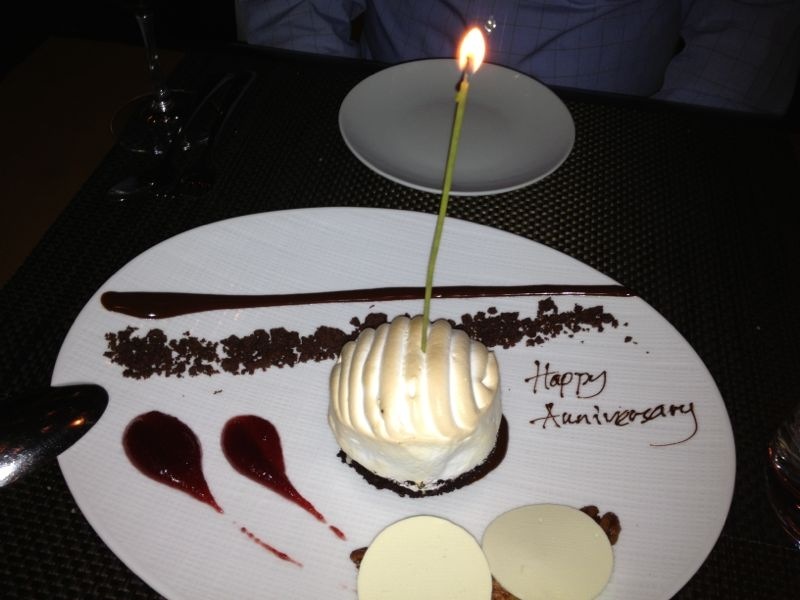 Baked Alaska – okay maybe a little fire. We love this place and it is high on the list of where we would go often if money were no object. Yes, that is one of our ratings. We don’t use the 5-point system, we use the ‘what if we won the lottery (which doesn’t exist here) and could eat anywhere anytime’ system! It is well worth the visit for that special dinner. And if any of our friends actually make it over here, we might even treat! (Might).